Ghosts, ghouls, vampires, witches, it’s that time of the year people and I hope it’s filled with delicious candy, fun costumes, and spooky vibes. I’m definitely one of those people whose seen Hocus Pocus and Halloween one too many times; I’m pretty sure some of that obsession had to do with a young Sean Murray. But does anyone actually know the origins of Halloween or do you think it’s just something that candy companies created to help their business? I’ve done some research-is it really called research if you enjoy doing it? So sit back and relax with some spooky music and your favorite candy (Reese’s Peanut Butter Cups all the way). It’s believed that during the eve of what we call “Halloween” the gap, or veil, between the land of the living and the dead is thin, like fabric stretched too far. This allows spirits called Aos Si to walk among the land of the living and wreak havoc among the living. So offerings were left outside of house to prevent the Aos Si from damaging any livestock or crops on the person’s property. People would also dress up to disguise themselves from the spirits or mimic them while reciting versus at neighboring houses in exchange for food. Carved turnips or other vegetables would be set out front to detour any evil spirits from entering homes as well. This is where the jack-o-lanterns we all know and love decorating came from, although we use pumpkins instead of turnips now, which I think is an upgrade. Skip ahead to 20th century Europe and you’ve got the basic foundation of what our version of ‘trick or treating’ is today. On the third Thursday of every October, children would march around in costumes holding their carved pumpkins singing spooky song. This was around the time that ‘Allhallows Eve’ was originated, if you’re not familiar with the phrase, no judgment, here’s a little explanation. In Christianity, November 1st is ‘All Saints Day’ or ‘All Hallow Day’ while November 2nd is ‘All Souls Day’ together, these 72 hours create ‘Allhallottide’ during this time period, people would respect the saints and the people who haven’t made it to heaven just yet. But as the years went on, this practice became more of a children’s holiday, children at heart apply here as well. In 1947 the term ‘Trick or Treat’ was coined and used in children magazines, radio programs, comic strips, and TV shows. Now everyone knows Halloween as a time of going door to door for candy, ‘trunk or treating’, reruns of spooky movies, and costumes of the hottest current trends. 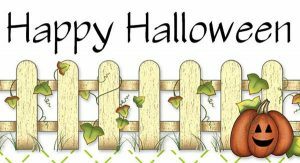 I hope everyone has a happy and safe Halloween, please be careful and look out for another blog coming soon! !